IAC Acoustics has more than 60 years of experience in the design and installation of audiology booths. We design, manufacture and install a wide standard range of high performance booths that offer noise reduction levels from between 35 to 60 dB. The 350 Series Maxi Booth is IAC’s newest Audiometric Booth. With internal dimensions of 894 mm wide x 948 mm deep x 2000 mm high, the 350 Maxi is an oversized version of IAC’s best selling Booth—the 250 Series Mini Sound Shelter. 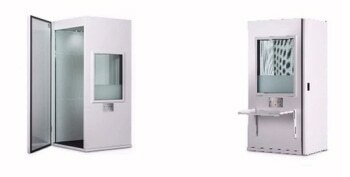 The IAC 40a series booths are constructed from 102 mm thick acoustic modular panels and offer a fitting environment for a whole range of audiological investigations and measurements. Acoustic double glazed vision panel within door (150 mm x 600 mm high).